After devouring a tasty pomegranate or pineapple, propagate them into a garden! Many common fruits and vegetables that we eat can be easily rooted and grown on a windowsill. Scraps from the kitchen are great opportunities to experiment and find out what will flourish. Try leftover lentils, garbage-bound garlic or a compostable carrot top. Use your imagination and observe what happens. Remaining portions of your favorite roots like carrots, beets, turnips, parsnips, and rutabagas will sprout leaves. Cut 1-1.5 inches from the top of your root. Place the cut end down in a saucer filled partly with pebbles for support and water. Keep your cutting in full light and new leaves should soon emerge. Another interesting way to grow roots for a short time is to cut a 2-inch section from your root and hollow out the middle to form a water reservoir. Pierce a skewer or toothpick (see figure 1) through the root and tie string to the ends and hang in a sunny window. Continually keep the reservoir full with water. Figure 1. 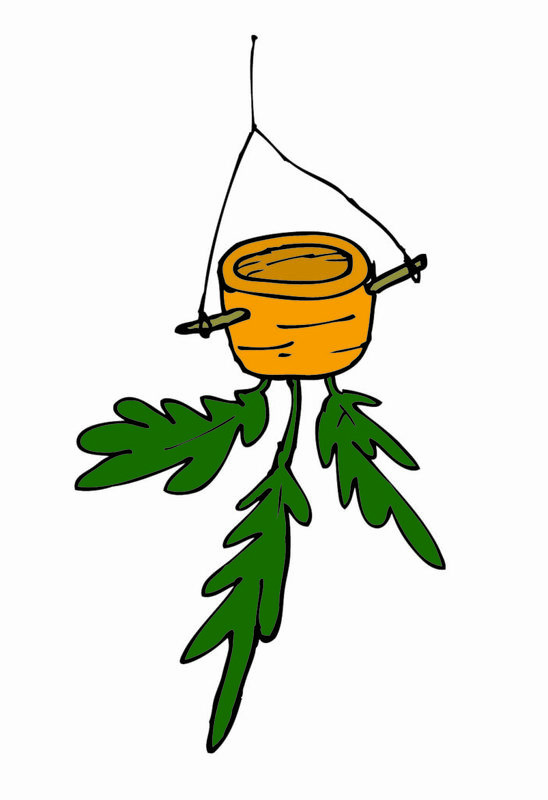 A discarded carrot top can be repurposed to grow a leafy mass of greens and used in a pesto! Before slicing a pineapple, firmly grasp the bottom of the fruit in one hand and with a wiggle of your hips, twist the leafy top off with your other hand. Another method is to slice (with adult supervision!) off the top inch of the fruit and carefully cut away most of the flesh to leave the stringy part from the middle. 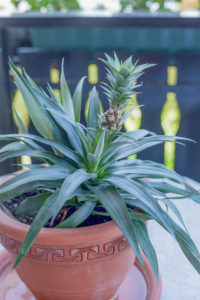 Leave the pineapple top out for a couple days to callus (this helps prevent rotting) and plant in a well-drained soil and keep in a warm place. You may also try rooting by putting the leafy top into a jar of water, changing it often to keep the water clean. Pineapples make great houseplants and can even produce fruit if kept in a warm environment or grown outside in the summer, Figure 2. Figure 2. Pineapple tops can be planted in containers and taken inside in cooler months. Ginger is a delicious addition to stir-fries and grows into a glorious glossy houseplant, which also smells divine when the leaves are broken and sniffed. Similarly to sweet potato and avocado, suspend the ginger root piece (about 2-3 inches) in water until it roots. Keep it on a warm, sunny, windowsill to await for the wondrous root emergence. Sweet Potatoes are fun to stick in a jar of water and watch what happens, Figure 3! Take a leftover pickle or mayo jar and clean it thoroughly. Put the narrow end of the sweet potato root into the jar filled with water, find a sunny spot and roots will emerge first, followed by shoots of leaves. Transplant into a larger pot for vigorous growth. Figure 3. Sweet potato sprouts are called slips and can be cut, rooted and grown into new sweet potatoes. 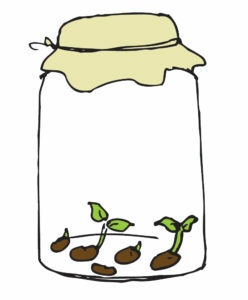 A potato can be grown in a similar way as a sweet potato, by putting into a jar and watching it sprout. Potatoes can also be cut into seed pieces, which are used to grow a potato plant. Find the potato eyes and have an adult help you cut the potato into pieces that have 1-2 eyes. Let the pieces sit out for a day or two and then plant into a well-drained soil. Plant right into the garden in the summer to get new potatoes. 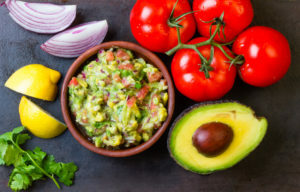 Tomatoes, Garlic, Onions, Lime and Avocado are common ingredients used in making the delightful dish of guacamole. Each produces waste that can be grown into a garden. Take the seeds from the ripe tomatoes and spread in a pot filled with soilless potting media. Cover lightly and germinate at temperatures above 60F. Once the seedlings have developed their first true leaves, gently transplant by taking them out of the pot, breaking the soil up and grasping the leaf of a seedling to release it. Plant into another pot by poking a hole into the soil with your finger and setting the seedling in and securing it with soil. Take a clove of garlic and an onion and bury it into a pot of well-drained soil. These plants have spectacular flowers and edible leaves but can emit a rather pungent odor. After using the juice and flesh in tasty ways, save the seeds to plant. 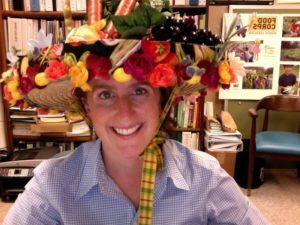 In a pot filled with soil, poke holes about a ½ inch down and drop a seed in each hole. Put multiple seeds in a pot and transplant them in the same fashion as the tomato seedlings. To extract the avocado fruit and seed, have an adult help you slice gently into the fruit until the knife meets the large seed in the middle. Finish the cut around lengthwise around the seed and to open the fruit twist each half in opposite directions. Pluck the seed out and put the flesh aside to use in the guacamole. Rinse the seed with warm water, poke it with 3-4 pins or toothpicks and suspend it in water, with the bottom of the seed barely touching the water. Keep it in a dimly lit location and in 3 to 8 weeks, the seed should split, revealing a root, Figure 4. Move to a sunnier locale, eventually transplanting it into a pot, leaving the tip of the seed sticking out the soil. Mangoes and lychee also can be grown this way. Figure 4. 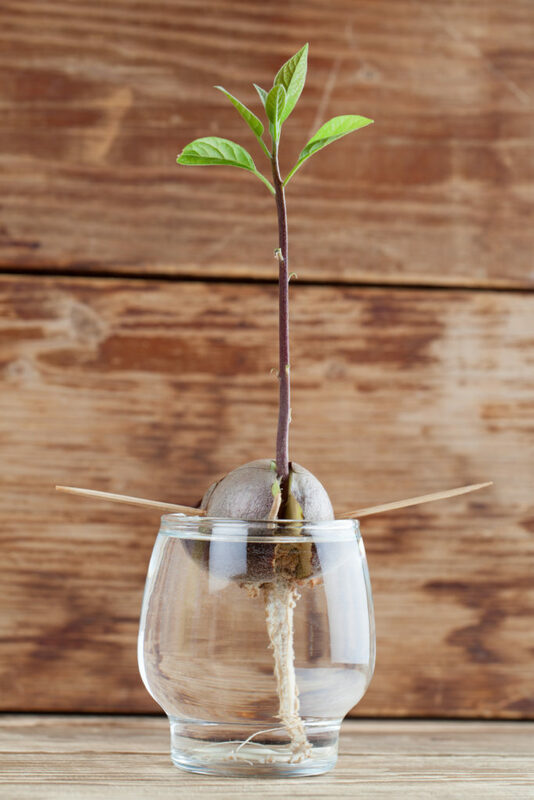 Avocado seeds can take a while to germinate, but are a great project for kids to try! Combine tomatoes, onions, and garlic together into a medium bowl. Fold in mashed avocados and flavor with 2-3 tablespoons of lime juice and salt. Serve with tortilla chips or pita chips, Figure 5. Figure 5. Guacamole is a tasty and nutritious snack. Herbs like mint, rosemary, thyme, bay, tarragon, and marjoram can be propagated from sprigs taken out of the garden. Find fresh shoots and trim off 3-4 inches. Strip the bottom leaves and plant in a well-drained pot filled with peat and sand. Make a mini-greenhouse by covering the pot with a clear Ziploc bag. Keep in a warm environment. Herb sprigs can sometimes root in water. Find a pretty jar or vase, strip the bottom leaves, arrange nicely and keep the water clean. Roots should emerge in a couple weeks. Dried beans and lentils can be grown into sprouts and harvested for salads and sandwiches. Soak the seeds in water overnight, drain and then place in an empty jar and cover the opening with cheesecloth. Rinse and drain the seeds twice a day. Keep the jar out of direct sunlight. Lentils should sprout and be ready to eat in only 2-3 days, other beans can be harvested and eaten in about 3-5 days, depending on how big you like your sprout. Remember to rinse until the water runs clear, if there is any type of funny smell, throw away and try again. Figure 6. Sprouting legumes is a fast and easy and tasty project! There are a lot of other fruits and veggies that can be grown from garbage into the garden. Scout for rotting pumpkins and melons, scavenge for dropped berries and try to grow anything! • Happy National Avocado Day!